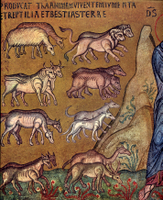 Both today's Genesis and Psalm passages celebrate the gift of the animal kingdom. The mosaic representation of the animals created on Day 6 of creation is from the Palatine Chapel in Palermo, Sicily. Commissioned by Roger II of Sicily in 1130-40, the chapel is one of the most beautiful of all medieval Christian churches. "The Palatine Chapel represents twelfth-century art patronage of the highest order; it is an extraordinary ensemble of materials, techniques, and styles. The pavement and wall revetments make extensive use of porphyry, serpentine breccia, and other colored stones in a variety of intricate ornamental patterns. The iconic and narrative mosaics that cover the upper walls of the entire chapel and the vaults of the eastern end are executed on a scintillating gold ground. Creation - Day 6, from Art in the Christian Tradition, a project of the Vanderbilt Divinity Library, Nashville, TN. http://diglib.library.vanderbilt.edu/act-imagelink.pl?RC=46177 [retrieved April 24, 2019].